How’s life in your corner of the world this Friday? Our boys are now officially done exams, completing grade 8 and grade 12, and we’re on vacation for a few weeks, and man, I’ve been waiting for a break! 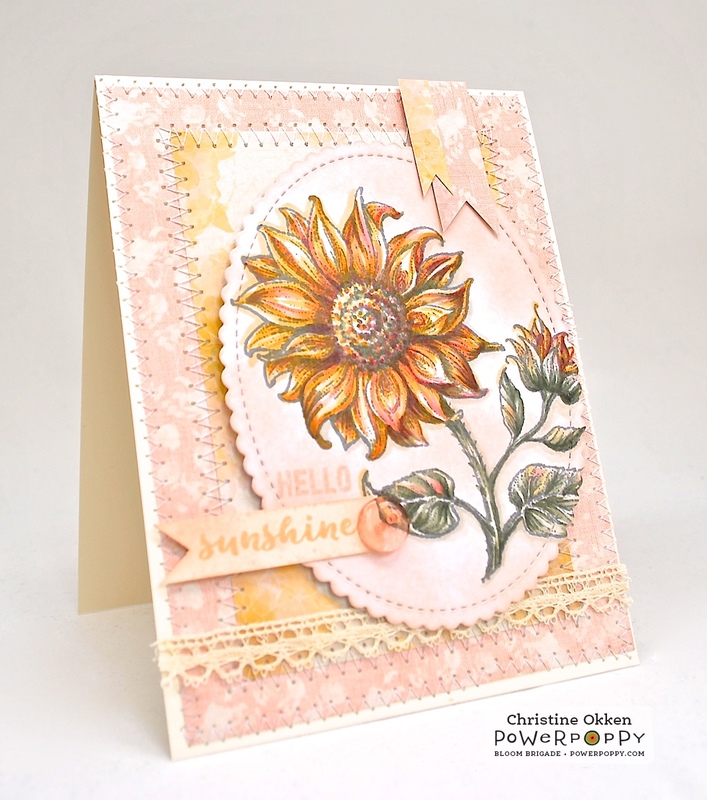 In that summery theme I pulled out the beautiful In Praise of Sunflowers set to celebrate the sunshine. I’m not usually a shabby-style cardmaker, but this just sort of went that direction, though it gave me lots of trouble. I was just having a day where nothing was going quite the way I thought it would, so my stitching is a little wonky, my paper tilted while I was sewing, and you just can’t rescue that. So I had to embrace the slightly uneven way it went. Isn’t this a fun trio of summery colours for our Hues to Use Challenge? 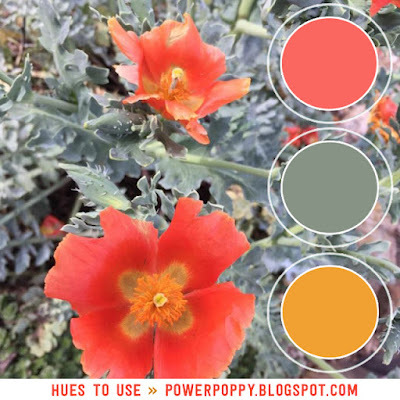 I’ll admit I went with more of the yellow tones with coral undertones for the sunflower, but it makes a warm pairing, contrasted with the cool of the sage green. Did you know that this month you could win a guest spot designing with our Hues to Use Challenge in upcoming weeks? What a great time to try out a new challenge. Here’s a closer peek at the colouring, I added some pretty lace and a button to accent all of that stitching. Hmmm... try as I might, I don't see a single imperfection, Christine. I only see an absolutely gorgeous card, all soft and pretty and feminine with a lovely design that makes me want to go play with paper and Power Poppy. You always inspire! Beautiful card and lovely colors. Christine, this card is lovely. The color combinations are subtie--it's what makes this card so lovely. Don't worry about wonky lines. . .some of us have to work hard to create them! Thanks for sharing your card. Just beautiful Christine. These colors are wonderful and you did a fantastic job using the sunflower as always. Love it. Wow, what a gorgeous card, Christine, and I love the layout and your stitching! 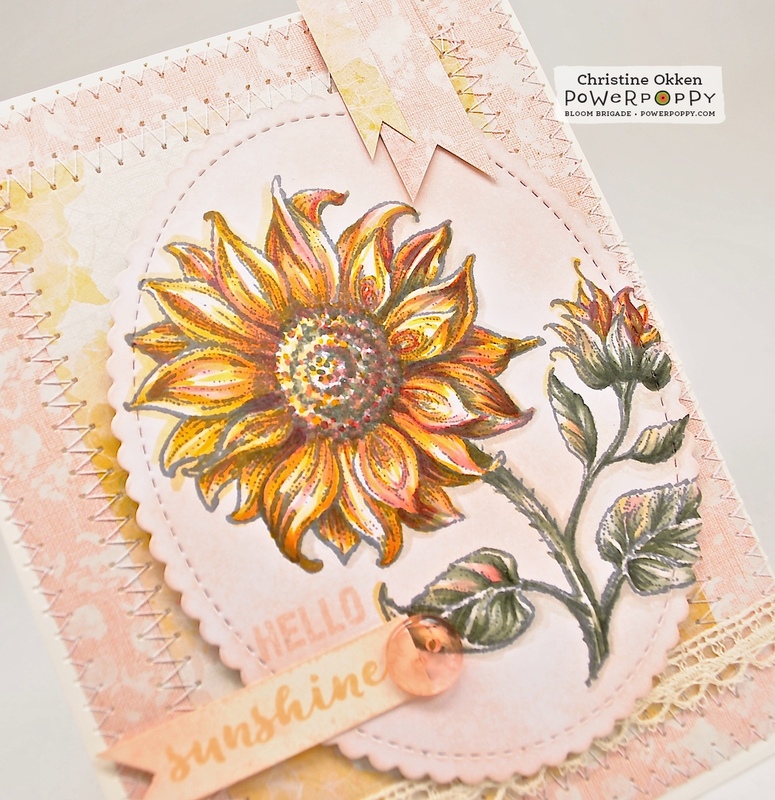 What a fabulous way to use the Hues to Use! Stunning in every way! Hope you all enjoy your vacation time...it's well deserved! Hugs!